When we found out we were moving to Hawaii, there were so many details that we needed to work out and many decisions that had to be made. After the initial freak-out-and-call-our-parents, we started going over everything that needed to happen. While there were many uncertainties, there was one thing we knew for sure that we wanted to do: rather than flying to Hawaii straight from Connecticut, we wanted to drive coast-to-coast. There were many reasons for this: first, we got more vacation days for doing so (10 rather than 2). We wanted to make sure the flight was as short and direct as possible for Charlotte’s sake. We had to drop off our car at a port to be shipped to the island. We wanted to make sure we saw our families before leaving the mainland. Most of all, we wanted — no, NEEDED — a good old cross-country road trip. We had been living on the East Coast for nearly 2 years and felt a deep desire to head West, to where the landscape is much more dramatic with higher mountains and wider plains, and with WAY less people. 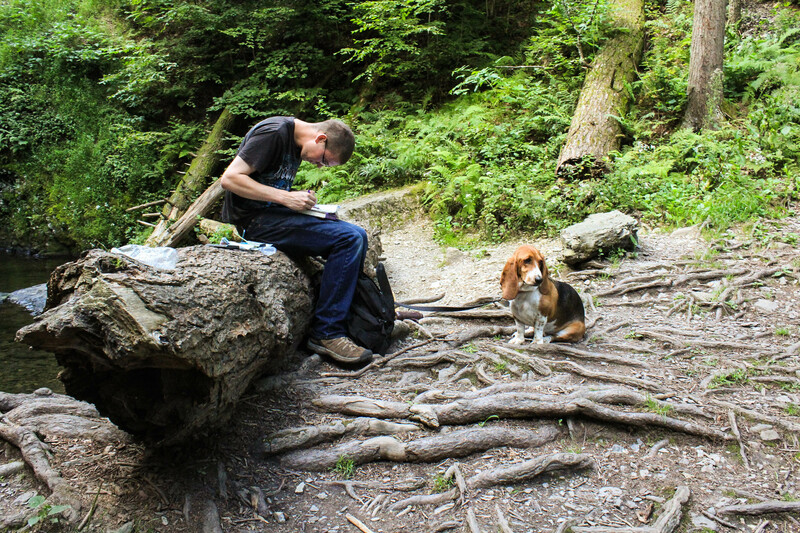 I had already planned out a whole road trip when we thought we were moving to Washington, and we knew that once on the island, we really wouldn’t be able to enjoy long road trips for several years. So it was decided, and we were counting down the days to this trip all summer! We crossed the Hudson and the traffic decreased substantially as we approached the Delaware River and Pennsylvania. We were able to see High Point in NJ as we crossed into PA. Once in PA, we figured we were ‘out of the woods’ traffic wise, so we got off the interstate and took the scenic route South along US 209 into Delaware Gap National Recreation Area. 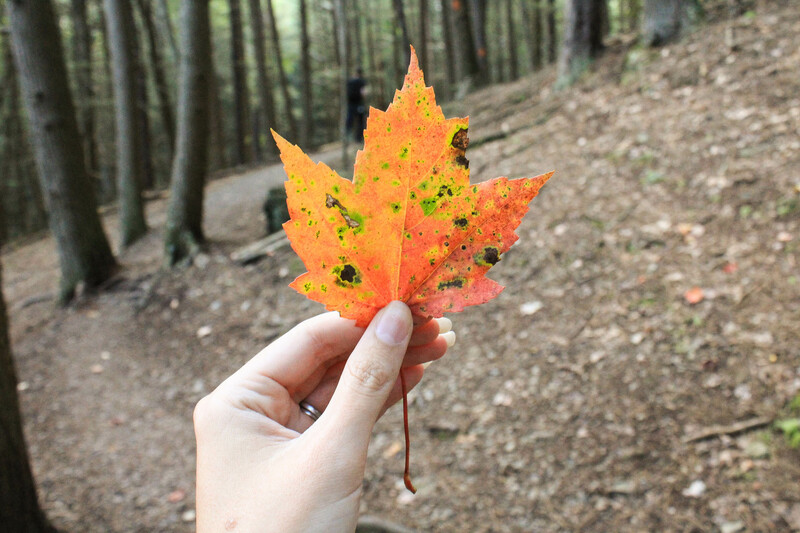 We stopped to grab our National Park Stamps and then stopped at the Pocono Environmental Education Center to do some letterboxing and hiking. 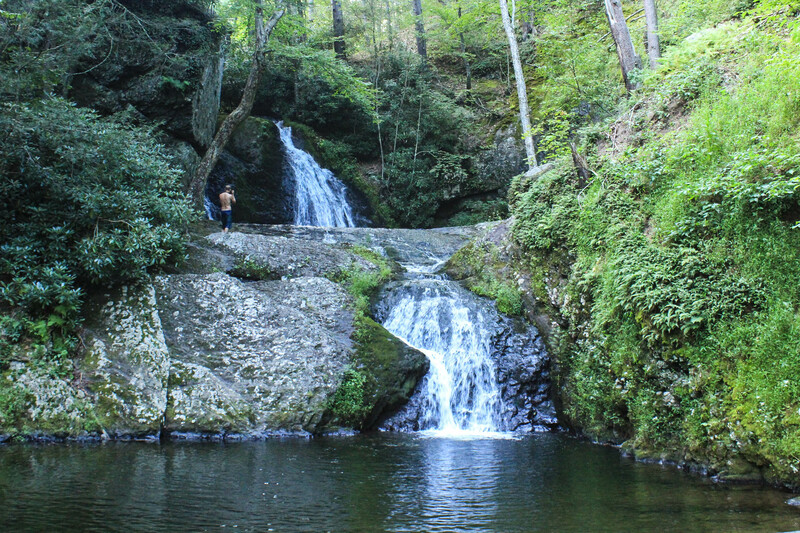 We continued on the trail, and took a spur trail that went straight downhill, but it was worth it for the large two-tier waterfall at the bottom. It had a decent flow for it being late summer, and we sat and enjoyed the area before moving on. Overall, this loop hike was about 3 miles and while it had its ups and downs was pretty easy to complete. After our hike, we continued South and picked up Interstate 80 heading west after grabbing some dinner. We had made prior arrangements to camp for free in one of Pennsylvania’s State Forests and made camp shortly after sunset. We were only perhaps a third of the way across Pennsylvania, but for us, (with the exception of Cleveland, OH and Chicago area) we had made it past the most difficult part — the most populated and congested area — of our journey. The next day we woke up before the sun, packed up camp and continued West on I-80. That early in the morning, and that far from any major cities, the interstate was quiet and it was enjoyable seeing a pastel sunrise and a sea of clouds fill the numerous valleys of the Appalachian Ridges. Our goal for the day was to make it all the way to my parents home near Grand Rapids, MI. But of course no road trip of ours is straight forward. We had two stops we wanted to make, both of them Whispering Giants. 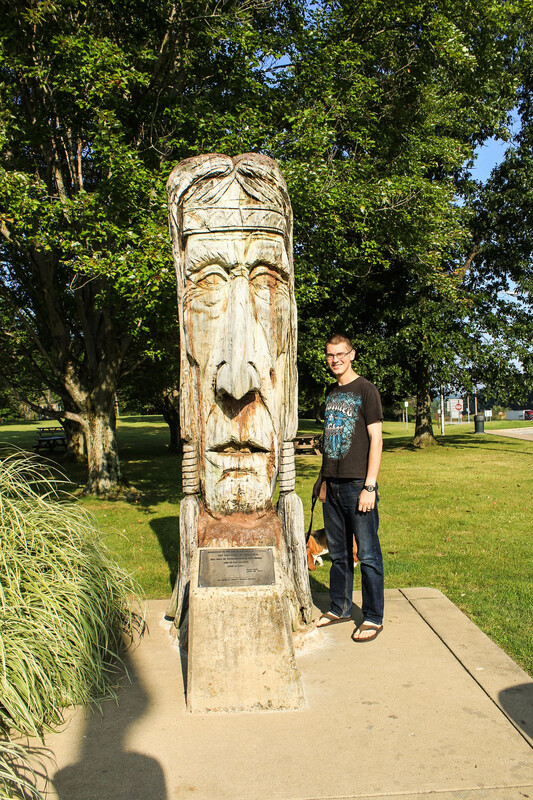 The first Whispering Giant was at a Rest Stop just on the Pennsylvania side of the PA-OH border. The Rest Stop was for the East bound lanes, but we found a way to the back of the property. 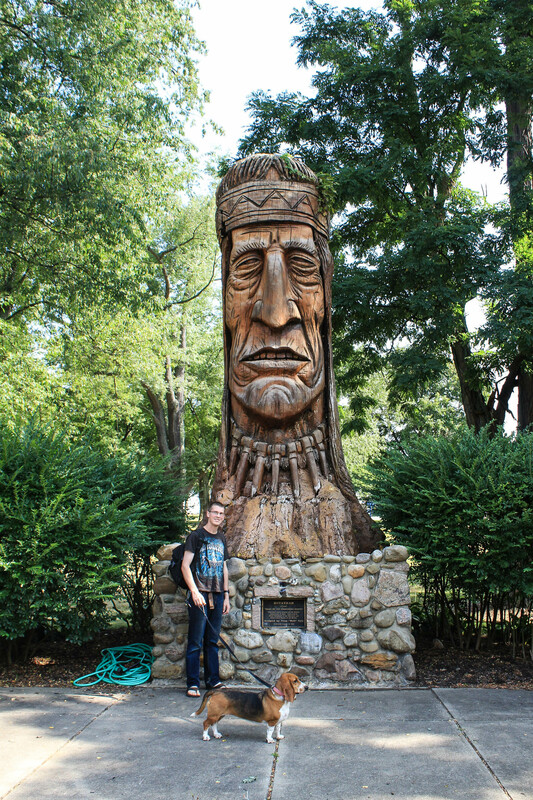 The giant in question was the 6th carved by Peter Wolf Toth and the second oldest still in existence. The second giant was in a park in Akron, OH. This giant, the 51st, is vastly different in detail and size — it was amazing to see the progress Toth made between the two. Once finished with these two stops, we pushed on toward our destination. This time, we followed 80 into Indiana, then took 69 for — you guessed it — new counties. We officially have entered into every county in the bottom 4 rows of the state of Michigan! It looks pretty cool on our county map. Clearly we aren’t going to be making much progess on that in the next several years, so we had to enjoy the few we were able to get on this trip. Other highlights from the last stretch of drive were getting frozen custard from Culvers and driving through Charlotte, MI — the county courthouse there was beautiful. Finally, we made it to Curtis’ family’s house!